Secure Forms - 3 layer encryption form technology. 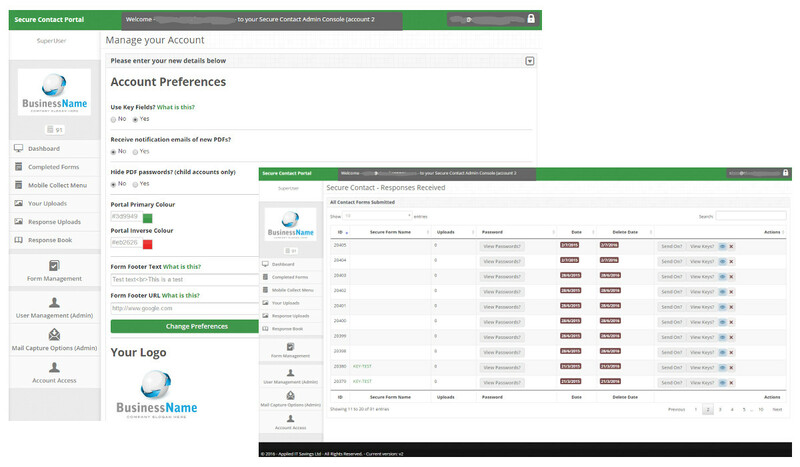 A secure way to gather information from your clients or prospective clients. From as little as £ 300 inclusive of form design and build - a total service in days not weeks. Secure Forms is a cloud based web application for use by clients that need to capture and store data which maybe subject to the latest data privacy laws (in particular EU privacy laws). All data is stored using 3 layers of encryption and held at rest using 256bit encoding in an EU located Data Center on the Microsoft Azure platform, critically we guarantee that no data is exchanged with any platform outside of the EU, so completely compatible with EU legislation. Your existing Web pages need only to encompass a small piece of html code into their own web site (where required) to invoke the web data capture form, this invokes the Secure Data Capture Form, which can display within an iframe as part of the page, or pop a new window or tab as needed, HTTPS access is utilised to ensure an encrypted session handles all data transport back to the cloud. 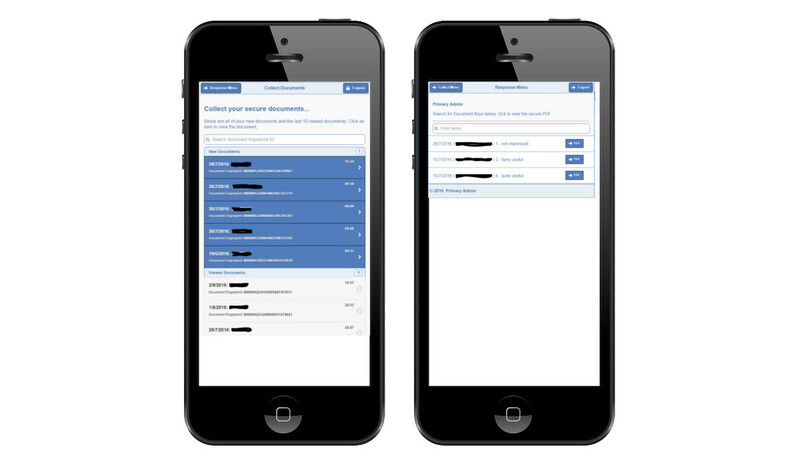 Forms can also include the option to upload attachments within the form, this is via the usual 'Browse Files' operational button which on a mobile device can also include the ability to capture photographs where needed, so real time pictures (jpeg) along with CV's or medical reports can be included. All attachments are encrypted and linked into the form, so before the attachments can be accessed or pictures viewed, the form password must be known and input by the intended recipient. Encrypted document passwords can be either sent separately to the intended recipient via email or using SMS directly from the control panel to a mobile phone, providing a two step verification with physical separation for very secure access to document content, mobile app screens allow a user with a mobile phone to simply retrieve their document when a notice of receipt arrives. Along with the main control panel two independent mobile web apps (Response Menu and Collect Menu) are provided for those who do not need to have access to the main panel (probably only the administrator would use the web panel). These web apps provide the facility to download documents recently received and also find documents via search keys which can be embedded within the form - thereby providing full search and retrieval facilities for mobile staff whilst on the move. The Control Panel provides customisation to meet your needs. The capabilities of the panel can be adjusted as necessary to hide/remove features. Multiple users can be set up with different access rights - keeping the main Administrator in full control but allowing delegation. For example; you can appoint an administrator to receive notices from the cloud service, they are then able collect and distribute the documents without knowing the document password - ensuring that any sensitive information the form contains (and it's related attachments) is only available to those who have also been given the password. From the Control Panel you can send Encrypted document passwords separately to the intended recipient via email or using SMS to a mobile phone, providing a two step verification with physical separation for very secure access to document content. Via the Panel you can also set forms so that the service notifies individuals using an SMS 'Receipt Notice' ensuring that the person who should receive the form is immediately notified when a form is completed. Then, for quick direct access they can use the link in the SMS notice to invoke delivery directly to their mobile phone and view the content there and then - instantly - including any associated attachments which maybe presented. Use our simple tools to embed the Secure Form into your existing website or online service - or use the unique URL to launch the form directly from our Cloud Service. You will begin to see the submitted form results (and attachments) available via our Web or Mobile portals, all documents are encrypted with your chosen passwords so safe to store or distrbute. Start using this unique service by contacting us today. Copyright © Applied IT Savings Ltd. 2016. All Rights Reserved.